Fiber Flux: Free Crochet Pattern...Snow Day Pillow Ornament! 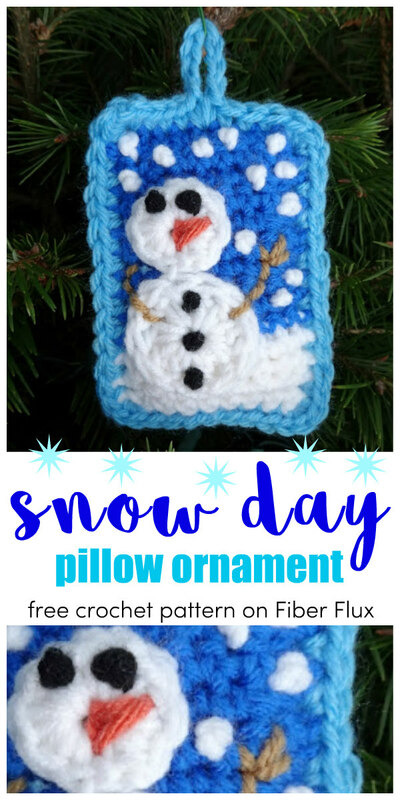 Free Crochet Pattern...Snow Day Pillow Ornament! 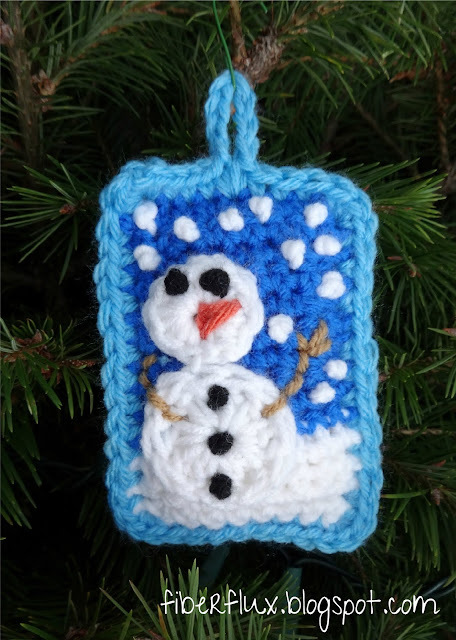 This fun snowman makes a festive addition to a tree or gift and celebrates the joy of snow! Scraps of yarn (I used Red Heart Super Saver in "Blue" "Bright White" "Black" and "Warm Brown" Also, Vanna's Choice Baby in "Little Boy Blue" and "Goldfish"
Note: The snowman's face, buttons, and snowflakes are all embroidered. However as an alternative you can use buttons, beads, etc. Row 1: In second ch from hook work a sc. Work a sc in each ch across to end. Row 2: Ch 1 and turn. In first st and in each st across, work a sc. Repeat row 2 a total of four rows in white, then switch to dark blue. Work row 2 ten times in the dark blue yarn. Repeat row 2 a total of fourteen rows. Round 1: Work 12 single crochet into center of ring and join with a slip stitch to close. Round 1: Work 12 double crochet into center of ring and join with a slip stitch to close. 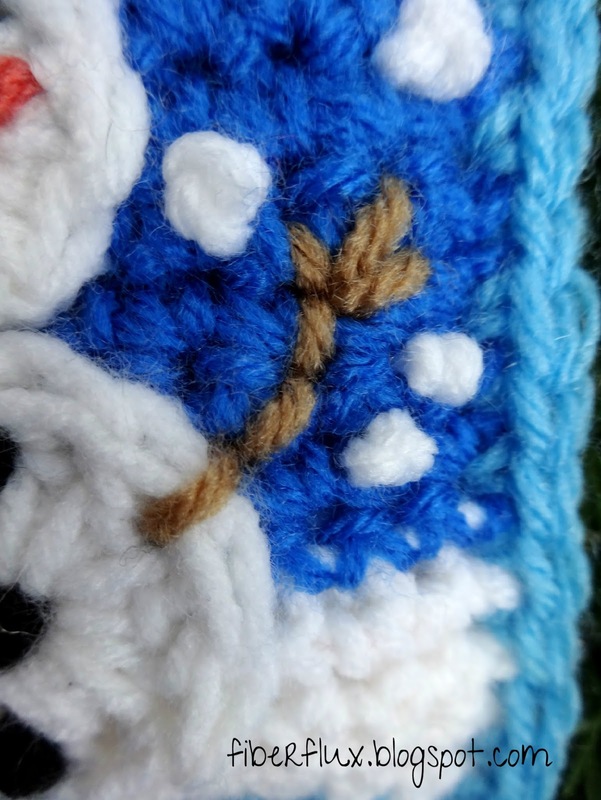 With a matching piece of yarn, sew snowman circles to front panel as shown. 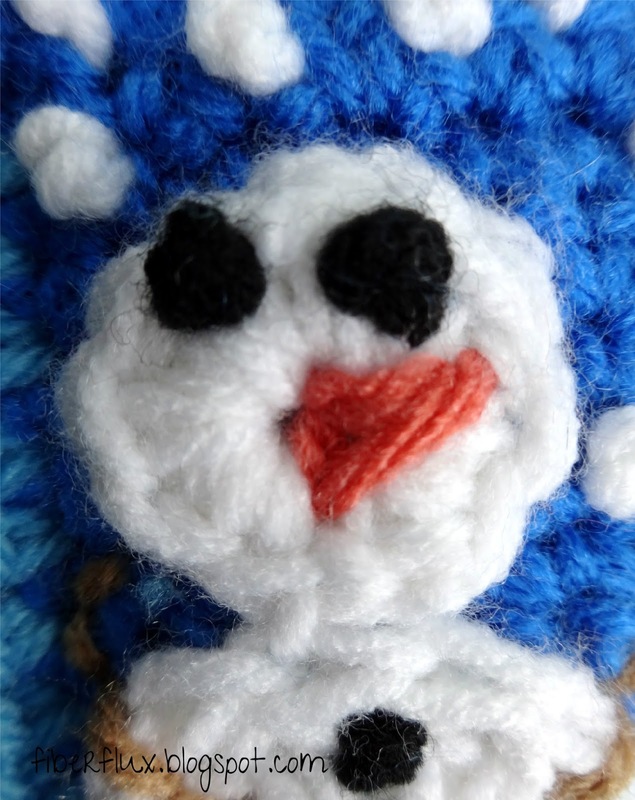 Using yarn scraps, embroider eyes, buttons, and snowflakes with french knots. Make carrot and branch arms with backstitch. Alternatively, you can attach button, beads, etc. instead of embroidering. Sandwich finished panels together with right sides facing outward. With contrasting yarn (I chose light blue), single crochet the two panels together using single crochet stitches. Begin in the upper left corner...in each corner work 3 sc, and along the sides, work just one sc. Continue around until you get to the top edge. Before seaming the top, fill pillow with your choice of stuffing (I used white yarn scraps, see materials list above for other suggestions). 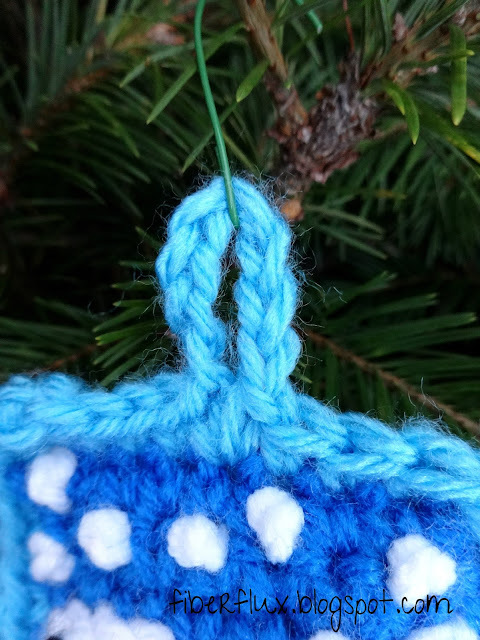 After stuffing, proceed to the middle of the top edge and make a hanging loop in the center top stitch by working (sc, ch 8, sc) all in that center top stitch. Continue seaming across and join with a sl st to close. Fasten off and weave in ends. 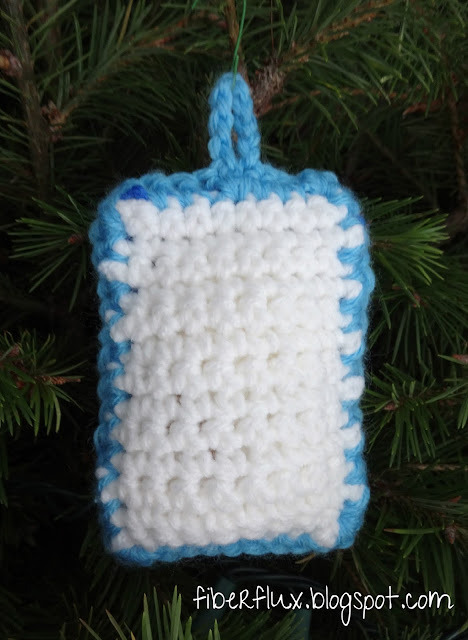 Your sweet ornament is ready to hang. Happy snow day! This is really cute. I'm going to try it this evening! Thank you for sharing your pattern!